Wind : 20 knots out of the northwest. Water Depth: 444 fathoms or 812 feet. Storms and subsequent rainbows with dolphins cavorting in the Okeanos Explorer’s bow wake get you asking the big questions. Not in the larger philosophical, sense but why is the Okeanos Explorer at 29⁰N, 79⁰W? 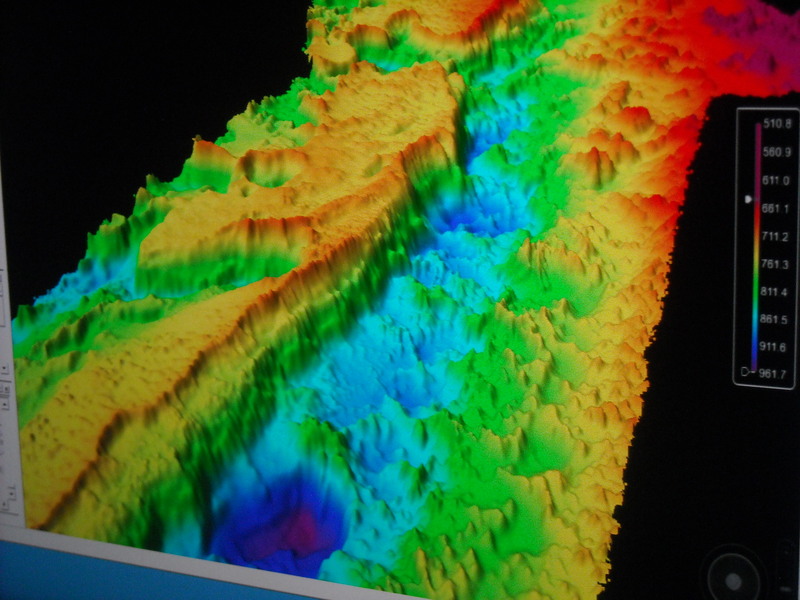 With 95% of the ocean unexplored, why did NOAA choose the Blake Plateau (Stetson Mesa) to map? I went to Derek Sowers, the Expedition Coordinator for this cruise, to find out. Derek is a Physical Scientist with NOAA’s Office of Ocean Exploration and Research (OER), which is the program that leads the scientific missions on the Okeanos Explorer. In preparation for the ship’s explorations this year, OER staff asked many scientists and ocean managers in the Gulf of Mexico and along the U.S. Atlantic southeastern seacoast for priority areas for ocean exploration.The main purpose for the Okeanos Explorer is to explore largely unknown parts of the ocean and then put the data and discoveries out there for other scientists to use as a foundation for further research and improved stewardship. OER staff boil all these ideas down to a few and talk about the pros and cons of the final exploration focus areas. Once an operation’s area is determined for a cruise, OER then asks scientists what additional science can be done in these areas while the ship is planning to go there. Much of this “extra” science benefits other parts of NOAA – such as the scientists that study fisheries and marine habitat. To manage this extra scientific work, the ship often hosts visiting scientists. 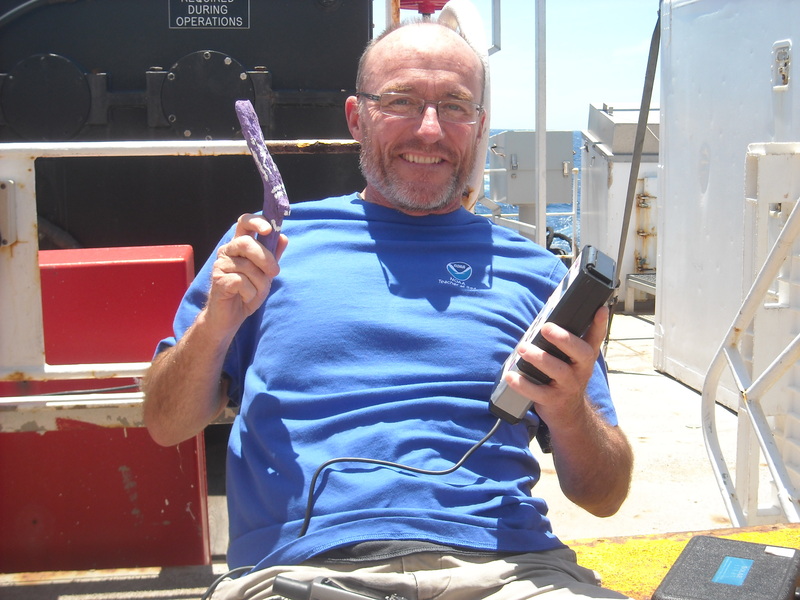 On the current cruise, Chris Taylor from NOAA Fisheries Oceanography Branch joined the cruise to lead the plankton tow and oceanographic measurement work to search for Bluefin Tuna larvae in this part of the ocean and to understand the ocean chemistry here. It is important to NOAA to multi task and utilize the ship 24/7 to accomplish numerous scientific objectives. During March and April, lots of details were nailed down and by the middle of April Derek knew that the expedition could include time to do the plankton tows and extra water sampling. Now, just like a family vacation, things happen along the way that require everyone to make changes. A road could be closed, someone could get sick, the car could break down. These expeditions are no different. So, how do decisions happen at sea? The crew of the Okeanos Explorer are responsible for safe operation of the ship and for supporting the visiting scientists in accomplishing their objectives for the cruise. The visiting scientists, as led by the Expedition Coordinator, must make decisions about how, where, and what needs to get done to accomplish the science objectives of the cruise. The Expedition Coordinator discusses these plans with the ship’s Operations Officer and she consults with the head of the various department on the ship (Deck, Engineering, Medical, etc.) and the Commanding Officer to most effectively support safely achieving the science team’s goals. There is a daily Operations Meeting for all of these leaders to meet and ensure coordination throughout the day so that things run smoothly on the ship. The Commanding Officer is responsible for making sure the crew implements their duties, while the Expedition Coordinator (often called the Chief Scientist) is responsible for making sure the scientists implement their duties. For complex decisions, like our present decision whether or not to go inshore to get a replacement plankton net, lots of factors are weighed and the final call is with the Expedition Coordinator and the CO. The Expedition Coordinator weighs trading off seafloor mapping time with getting more plankton data and decides if it is worth it to go get the net. Commander Ramos must decide if it is safe and reasonable to do so and makes the final decision of where and what the ship does. For seafloor mapping work that happens 24 hours a day, there are three teams of two people who “stand watch” on 8 hour work shifts (called a “watch”). Each watch has a watch leader that works at the direction of the Expedition Coordinator. The Watch Leader ensures the quality of the mapping work accomplished during their 8 hour watch. The ship’s Survey Technician, Jacklyn James, works closely with the visiting mapping scientists to run all of the complex computer systems under standard operating procedures. Here is an example of how routine small decisions are made. Let’s say that Vanessa Self-Miller (see personal log) is on duty as the Watch Leader and wants to have the ship move over 500 meters to get better sonar coverage of the seafloor below. Vanessa uses the intercom to call the deck officer on the bridge and tells the officer she would like the ship to move over 500 meters. The officer checks the AIS (see last blog) and sea conditions to see if this would be a safe maneuver for the ship. The reasons for not approving the mapping team’s request would almost always be safety based. Most of the time, the officer says “Sure Thing. Roger That.” and in the space of a few minutes the ship has changed course as requested. The answer to “why are we here?” is a complex, time-consuming endeavor, but when it works, like on this expedition, it is magic to watch unfold. The storm was not one of those Illinois summer thunderstorms that come racing in from Iowa – gathering energy like a 5th grade class the last few weeks of school. Nope. No simultaneous lightning thunder howitzers that you feel in your spine; just some lightning and wind gusts to 50 knots, but I sure wanted to see how things looked from the bridge once I heard the foghorn. The bridge on the Okeanos Explorer is one of my favorite places on this ship. I always ask permission for entry and if the circumstances allow, the officer on duty will grant it. Operations Officer Lt.Rose’s IPod was playing Pink Floyd while she divided her attention between the myriad of dials and screens and talking navigation with mapping intern Kalina Grabb. AB Tepper-Rasmussen and NOAA Corps Officer LTJG (Lieutenant Junior Grade) Bryan Begun peered into the foggy soup and monitored the AIS. The irony of the moment struck me because while the crew unconsciously played percussion on the brass rail overhead or mumbled lyrics and David Gilmour and Roger Waters sang about not needing an education, there was so much education and proof of education going on in this little room. That is the defining image I’ll always have of this space on the Okeanos Explorer. It is a place where the acquisition and exhibition of knowledge are so evident and invigorating. You can’t spend more than 4 minutes in this space without learning something or being amazed at how smart these people are and how devoted they are to use that knowledge to carry out the science of this mission. On this particular night, the skies lifted and we had hopes of seeing a launch at Canaveral, 40 miles to the west. 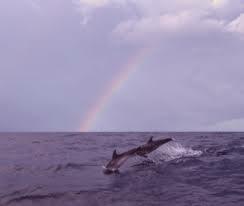 Lt. Rose announced to the whole ship that a double rainbow could be seen portside and even the dolphins responded to her call to educate the right side of our brains. In addition to spending time on the bridge- I have been helping with the XBT launches, using the photometer to add data to the NOAA’s Aerosol Project – with the ever faithful Muffin from good ol’ Hampshire Elementary and preparing for a night launch of CTD and plankton tows – more on that next blog. Like all women, Vanessa Self-Miller’s mom was great at multi-tasking. While she got things rolling for the evening in the household, Vanessa was her mom’s guinea pig for the next day’s science lessons for her 6th grade students at Jackson Middle School in Jackson, Louisiana. She also instilled a love of the scientific method in her daughter. Her father was a math guy and found out early that Vanessa was going to be the 3rd wheel with her brother on typical father son activities that involved mechanics or being out in nature. That nurturing and her work ethic prompted Vanessa to get a degree in physics at Southern University in Baton Rouge, Louisiana. She went on to work for the U.S. Navy as a hydrographer doing a lot of mapping harbors and near the shore. She received her masters degree in Hyrdrographic Science from University of Southern Mississippi. Now she is thrilled to be a physical scientist/hyrdrographer for NOAA. While it is a challenge to coordinate job related travel with her husband and two children, she loves working for NOAA. 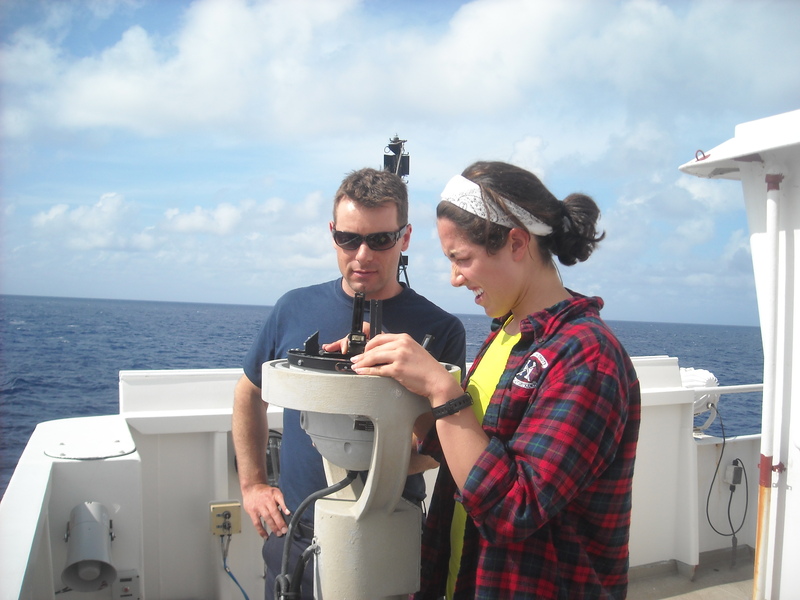 NOAA respects a work-life balance and that allows her to pursue her passions in life. She wants to encourage all students but especially the young girls to start early in their path to a career in science. She feels that how parents nurture their girls is important in their seeking employment in the fields of science. On a personal note, any time a question came up from this naive teacher or any of the mapping interns, Vanessa was able to answer it completely and without pause. She encourages all the 5th graders out there, male or female, to pursue their scientific oceanographic dreams. NOAA will need today’s fifth graders to investigate sea level rise and all the Ocean Engineering energy products that our country will need twenty years from now. There will always be a need for scientists who love to explore and want to work for NOAA.